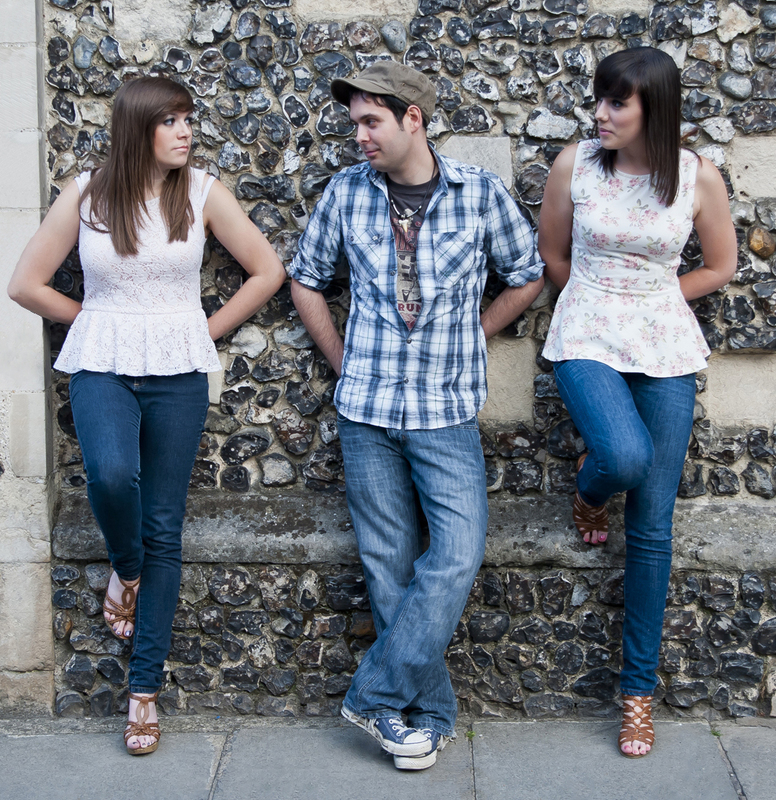 ORFILA are a UK country trio consisting of siblings Abi, Louise and Matt Orfila from Folkestone in Kent. They first performed together as a band in mid 2012 when they supported BBC Radio 2 playlist singer/songwriter Ben Montague. Originally intended to be a one off show their set of originals and covers was warmly received and the band decided to continue playing shows together. They have since released two albums Writing On The Wall and Never Slowin’ Down. Orfila were invited to be part of C2C Festival this year and I caught up with them just before to have a quick chat. Hello, great to chat to you today. Can you please introduce yourselves and tell me what part you each play in the band as well as something about yourselves? Maybe something you like to do that’s non music related, a favourite TV show or anything really? Hey! So the band consists of Matt (guitar, backing vocals), Louise (vocals) and Abi (vocals, percussion). Matt: I’m a massive geek and love going to film conventions. I actually met Mark Hammil last year and quoted a line from when he was in The Simpsons. He loved that! Lou: Well I really like to read and would like to read a lot more this year! My New Years resolution is to read a book a month in 2017… My ‘chill’ time is limited so it’s split between reading and watching Nashville!!! Matt and Abi call me ‘Monica’, as in Monica from the TV show Friends (we are Friends fanatics!) because I like to be super organised, cook and I am a clean-freak! Abi: I have a massive obsession with chocolate milk! 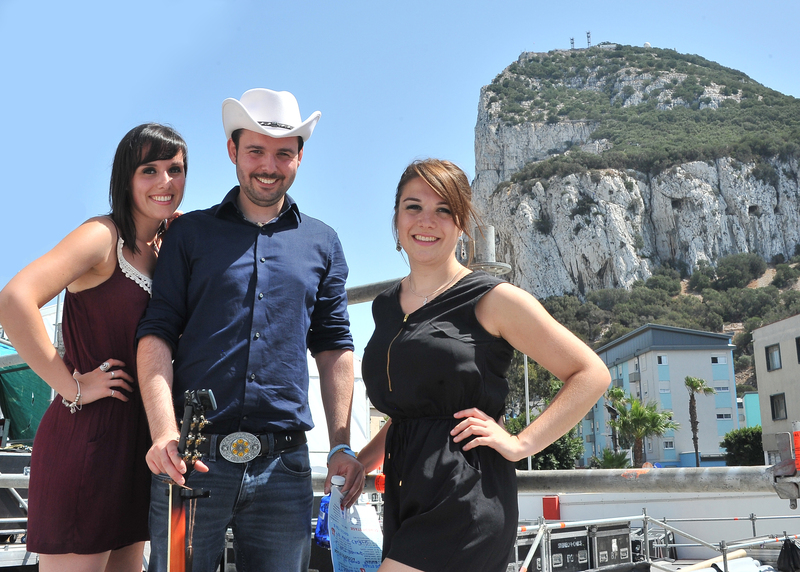 How would you describe Orfila and please could you tell us about why you picked your surname for the band name? We are a sibling band and love country music! We write the majority of the songs we play and each have our different influences. The main thing we focus on is vocals and use a lot of three part harmonies! We couldn’t really think of a name that we all liked and thought our surname would be relevant and unique! How are you finding the UK Country Music scene and the UK Country fan base? Do you think it has grown rapidly over the years and do you think artists such as Ward Thomas and The Shires have opened the windows of opportunity for more UK acts to emerge and be heard? The UK country music scene has just grown and grown over the past few years and it’s fantastic!There’s always been appreciation for country music but it’s definitely become more and more popular in recent years.The Shires and Ward Thomas have definitely been a massive part of that by making country music accessible and popular to a wide audience. The fan base is also very dedicated…and we’re part of that because we’re huge fans of country music! We saw Zac Brown Band at Wembley in 2015 and it was amazing to see it sold out for a country band that aren’t hugely well known in the UK. It shows that there’s a lot of support for country bands over here. You are playing at C2C Festival which is great. How was the application process for you? It was so tight this year with so many applications, were you at all nervous about not being selected? Playing C2C was always a huge goal for us since day one because it’s the biggest country music festival in the UK and has featured some of our heroes and inspirations over the years. We were so lucky to play last year after winning the first ever Yamaha Soho Hoedown to earn a slot and that was a huge moment for us. We had applied a few times before then via the standard online application and hadn’t been successful so we weren’t really sure what to expect this year…we just applied and hoped for the best. The UK country music scene is incredibly strong and we knew that we might not get picked to play so I guess we were a bit nervous because we had such an amazing experience last year and we really wanted to repeat it. We just had no idea whether the organisers of C2C would be interested in having us back. Luckily they did and we couldn’t be more excited! What times will you be playing and on what stages? We’ll be playing two sets on the Sunday; one at 3.25pm on the Grand Entrance Stage and in the Saloon at 5.25pm. We’ll be playing a lot of stuff from our latest album “Never Slowin’ Down” with perhaps a country cover or two thrown in for good measure! Will you be catching any performances over the weekend, if so who? Yes definitely! We’ve got tickets for Friday and Saturday and are really looking forward to seeing Brad Paisley, Chris Young and Darius Rucker! We’re also looking forward to seeing some of our friends who are also playing the pop up stages. Do you think C2C is a great platform for not just UK acts but new acts and unknown acts – and for you personally, has it lead to any other career opportunities such as festivals or being booked for gigs? I can imagine C2C is a pretty good thing to have on the tour rosta? Playing C2C is an amazing thing to have on the CV! 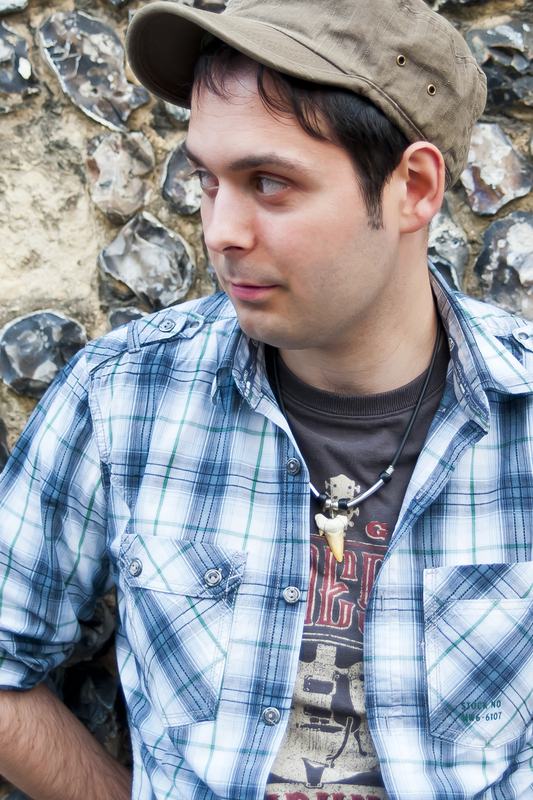 I think it has led to a few really cool things for us, such as opening for The Stereophonics last September and being featured on BBC Radio Kent and in Maverick Magazine. Matt: Bob Dylan really inspired me to write music…his songs are like poetry and in my opinion he’s one of, if not THE, best songwriter of all time. In terms of country musicians, Brad Paisley is probably my biggest inspiration. He’s just top of the tree for me. In my opinion he’s the best all-round artist in country music today; an amazing vocalist, guitarist and songwriter. He’s a huge inspiration for me! Lou: My musical influences are Dolly Parton, Little Big Town, Gavin DeGraw, Lady Antebellum, Shania Twain and Taylor Swift. Abi: Ed Sheeran is my biggest musical influence because he believes in himself so much and takes every possible opportunity that comes to him. He didn’t quit when it got tough; this industry is very competitive and it’s easy to give up. Every song of his I can relate to and youcan tell he worked so hard to get where he is today and didn’t let anything hold him back. He’s still moving forward and believes in what he does and that’s so admirable and inspirational. You perform and record a lot of cover songs as well as original material, do you feel more confident performing an original song or a cover or is it a mix? At the moment we have a standard set of songs that we all know really well and we kinda stick to those songs at the moment. Most of them are originals fron our latest album but I guess in general it doesn’t really matter whether it’s a cover or an original, we try to be confident with whatever we’re playing. You released your album Never Slowin’ Down last year. How would you describe it lyrically and sonically to someone who does not yet know your music? The main theme of “Never Slowin’ Down” is that life is a journey and sometimes you just have to follow your heart and keep going, even if sometimes it feels like you’re going nowhere fast. Within that there are songs about doing what you want to do, proving people wrong, falling in love, getting your heart broken and loved ones passing away. The songs were just from the heart and were what we wanted to say when we were writing for it. How has it been since it’s release fans and critics wise? The first single from the album “It Would Be You” had an amazing reponse and made it into the top 10 of the iTunes UK country charts which was amazing! Reviews for the album have been really good so far and we got a 5* review from country music magazine Up Country which was fantastic. What single will you be releasing next? Not too sure about that yet! You’ll have to wait and see! We usually open our set with a cover of Little Big Town’s Boondocks because it gives us the opportunity to demonstrate our three part harmonies. We are big fans of Little Big Town and that song is awesome! Where else can we see you play this year? We’ll be playing at the Bluebird Sessions in Kelvedon on 26th March, the Sound Lounge in London on 18th April and we’ll also be at Buckle and Boots among others. What is next for Orfila? This year marks the fifth year we’ve been together so we are hoping to do something special for it, possibly some more recording!